After finishing her violin study at the Craiova Music High School, Gabriela Popescu later dedicated herself exclusively to classical singing at the Bucharest Music High School, and studies at the Bucharest Music Academy under Professor Arta Florescu. The young artist soon received scholarships in Bayreuth and Florence. Master Classes with Ileana Cotrubas and Margarita Lilova in Vienna completed her training. In 1992 she won first place in the Robert Stolz Competition in Hamburg. In her first engagement at the Magdeburg Opera House from 1989 to 1992, Gabriela Popescu sang important parts, including Erda, Fricka and Waltraute. Soon she was making guest appearances at renowned European opera houses like Paris (Giulietta from Offenbach's Hoffmann's Tales in the Bastille Opera), Vienna (Fenena from Verdi's Nabucco at the People's Opera), Brussels (Smeton from Donizetti's Anna Bolena and Triptychon by Puccini at the Théâtre de La Monnaie), Toulouse (Maddalena from Verdi's Rigoletto at the Théâtre du Capitole), Lausanne (Olga from Tschaikowsky's Eugen Onegin at the Théâtre du Jorat), Bilbao (Federica from Verdi's Luisa Miller at the Teatro Coliseo Albia), Marseille (Frugola from Puccini's Mantel at the Marseille Opera), Oslo (Carmen by Bizet at the Norske Opera), Toulon, Lüttich, Reims (Azucena from Verdi's Il Trovatore), Hamburg (Triptychon by Puccini at the Hamburg State Opera), Nürnberg (Ulrica from Verdi's Ballo in Maschera at the Nürnberg State Theater), Nancy (Sorcière from Prokofiev's Der feurige Engel at the Nancy Opera) from 1992 to 2001. She has worked with famous directors like Roman Polanski, Vittorio Rossi, Harry Kupfer, Nicolas Joël, Antonello Madau Diaz. in Berlin in 2002 and 2003 with the Berlin Symphony Orchestra; invitations to Opera Galas, vocal-symphonic concerts or song evenings in the well-known European centres (Budapest, Basel, Berlin, Venice, Lausanne, Cologne, Bamberg, Hanover, Madrid); the tour of the far east – opening success in Japan (2002 with song evenings and concerts of the Christmas Oratorio and Messiah by Händel) was followed by performances of Aida in Tokyo (in the Orchard Hall) and in Osaka (in the Festival Hall), as well as in other big towns in Japan (2003). In 2006 she sang the role of Amneris in Aida at the Daejeon Arts Center, Gwangiu Arts Center and in 2011 at Deagu International Opera Fesival (South Korea). in 2004 as Amneris in Aida, in 2006 as Azucena (Trovatore) and as Delilah in the concertante performance of Samson and Delilah (2007). In the International George Enescu Festival 2007, she shone with arias from operas and oratorios by Händel, and performed together with the Munich Bach Soloists conducted by Gerd Schaller. 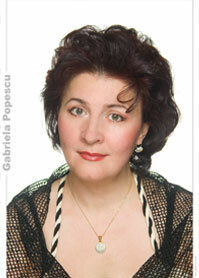 Gabriela Popescu received ovations in January 2008 for her interpretation of the part of Principessa in the concertante performance of the opera Adriana Lecouvreur of Cilèa, together with the Radio Symphony Orchestra of the Bucharest National Broadcasting. She gained great recognition with the same ensemble with the interpretation of orchestral songs by Richard Strauss in October 2008 and in January 2009 with the part of Hérodiade in the opera by Jules Massenet. In April 2009 sang the role of the Fairy Morgana in a concertante performance of the opera Merlin by Karl Goldmark, as a world debut recording for a CD (production of Bavarian Broadcasting). and „the four last Songs“ by R. Strauss) great success from 2008 to 2014. Verdi / Requiem at Kyungpook National University in Daegu. Lecturer for classical Singing at Otto-von- Guericke-University in Magdeburg ( from 2003 to 2008).